Last Week in Review: There was good news in the housing and labor markets, plus the minutes from the Fed's March meeting were released. Forecast for the Week: Look for key news on housing, consumer inflation, consumer spending, and manufacturing. View: There's a new scam this tax season. Be sure to read the details below and share them with clients and colleagues. "The one function that TV news performs very well is that when there is no news, we give it to you with the same emphasis as if there were." David Brinkley. While last week's economic calendar may have started off on the quiet side, the news picked up steam in the second half of the week. Read on for the highlights. There was good news in the labor markets, as weekly Initial Jobless Claims fell by 32,000 in the latest week to 300,000. This was near a seven-year low and a signal that the labor markets may be coming out of hibernation as spring starts to bloom. In addition the 4-week moving average of claims, which irons out seasonal abnormalities, also fell. Meanwhile, the Consumer Sentiment Index for April came in above expectations, showing that consumers are feeling positive about the economy as we head into warmer months.The housing sector also had good news to report, as foreclosure activity across the nation continues to decline. RealtyTrac reported that foreclosure filings fell to the lowest level since the second quarter of 2007. In addition, March was the forty-second consecutive month where foreclosure activity decreased from the previous year, with foreclosure filings declining by 23 percent from March 2013 to March 2014. After last week's quiet economic calendar, this week features an array of reports touching on key segments of the economy. Economic data comes right out of the gate on Monday with Retail Sales, which is a measure of consumer spending. On Tuesday, we'll get a read on inflation at the consumer level with the Consumer Price Index. Look for key manufacturing data on Tuesday with the Empire State Index, followed by the Philadelphia Fed Index on Thursday. Housing numbers from the National Association of Home Builders Housing Market Index will be reported on Tuesday, while Housing Starts and Building Permits for March follow on Wednesday. These reports may show if the soft numbers earlier this year were due to the harsh winter weather—or if they were the start of a downtrend. All capital markets will be closed on Friday in observance of Good Friday. In addition, the Bond markets will close early on Thursday at 2:00 p.m. EDT. 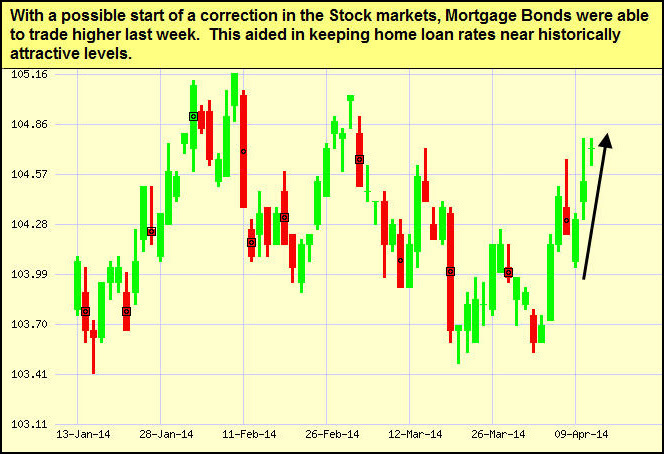 As you can see in the chart below, Bonds were able to improve last week. With a busy economic calendar ahead, I'll be watching the markets closely this week. Watch out for bogus e-mails claiming there's a problem with your 2013 tax return. By Cameron Huddleston, Kiplinger.com If you get an e-mail that appears to be from the IRS and claims that there is a problem with your 2013 tax return, do not respond. It's the latest scam to surface this tax season.Scammers are sending phishing e-mails that appear to be from the IRS Taxpayer Advocate Service and warn taxpayers that their 2013 income has been flagged for review due to a document processing error, according to the IRS.To resolve the issue, recipients are instructed to contact the IRS Taxpayer Advocate Service by clicking on a link within the e-mail. The link supposedly provides information about the taxpayer advocate assigned to their case or allows taxpayers to review their reported income. However, the IRS reports that the link actually leads to a Web site that solicits personal information—which thieves can use to steal your identity or access your accounts.Although the Taxpayer Advocate Service is a legitimate entity, it does not initiate contact with taxpayers by e-mail, text or any social media network—nor does the IRS. If you receive an e-mail that appears to be from the IRS or Taxpayer Advocate Service, do not reply to it and do not click on any links within the e-mail. Forward the e-mail to the IRS at phishing@irs.gov.Also beware of phone scams during tax season. Scammers have been calling people across the country claiming that they owe money to the IRS and making threats including arrest if they don't pay up, according to the IRS. Learn more about this phone scam as well as steps to take to lower your risk of fraud during tax season. The Kiplinger Washington Editors. Kiplinger.com.